We’d love your help. 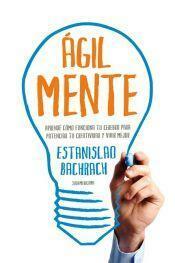 Let us know what’s wrong with this preview of ÁgilMente by Estanislao Bachrach. To ask other readers questions about ÁgilMente, please sign up. Absolutamente infantil, sobredidáctico, si no tenés 8 años sentís que el autor te está tratando de estúpido todo el tiempo. Tenía muchas expectativas y tuve que dejarlo a la mitad porque la estaba pasando muy mal. Probablemente este es el único autor que ha llegado a conquistarme para leer este tipo de libros que no me llaman la atención generalmente. Lo que más me gustó es que Bachrach tiene una forma de plantear cuestiones científicas de lo más sencilla y entretenida, lo que hace que el texto no parezca tan pesado. Por otro lado, hay muchos datos que resultan de lo más interesante conocer respecto a nuestra evolución, y particularmente la de nuestro cerebro. Este es un libro que me gustó bastante, y un po Probablemente este es el único autor que ha llegado a conquistarme para leer este tipo de libros que no me llaman la atención generalmente. This book is supposed to be on creativity but mainly expains various parts of the brain and how they work, with a reference in each chapter to creativity, a few chapters on creativity influences and many short exercises to stimulate creativity. Maybe it's a translation failure but the author, who is Argentinian, tells us that gorillas are humans' nearest relatives. No, the common ancestor of the chimpanzee and the bonobo split from the evolutionary branch with us more recently than the ancestor This book is supposed to be on creativity but mainly expains various parts of the brain and how they work, with a reference in each chapter to creativity, a few chapters on creativity influences and many short exercises to stimulate creativity. Maybe it's a translation failure but the author, who is Argentinian, tells us that gorillas are humans' nearest relatives. No, the common ancestor of the chimpanzee and the bonobo split from the evolutionary branch with us more recently than the ancestor of the gorilla. We could really, really do with a picture or two of the brain, with parts labelled. No pictures, diagrams or charts are given. I'd suggest a few showing how we differ from monkeys, great apes and individuals with brain damage. The test your creativity quiz. Questions are scored one to five; it is obvious that those answering one are answering for a more creative mindset, work environment or job. "I have a good system for generating new ideas for any type of challenge. Strongly agree 1, agree 2, neutral 3, disagree 4, strongly disagree 5." We are told to add up our scores and those scoring 130 to 150 are in the top ten percent of creative individuals, those 110 - 129 with room for improvement, 85 - 109 not great, 84 or less, in a danger zone for low creativity. This should be checked by copy-editors if the author can't put the effort in to check it himself. Talking about 'Beeman observed' problem solving and associated brainwaves, the author tells of alpha wave activity, visual input, gamma brainwaves and firing neurons. "But once that cocktail of neurochemicals vanishes our motivation quickly subsides." Which neurochemicals would those be? He hasn't mentioned any. Overall this comes across as something dictated rather than written, with frequent stream of consciousness, much reference to other people's experiments and none to experiments of his own. The author lets us know of his apparently threatening traffic (traffic is polite here) and keeps reminding us about leopards, when for modern human history we've been under much more threat from humans. The author adds that anyone can be creative - but I tend to think that the readership is self-selecting and those not interested in creativity are not going to read this book. He also says that high creativity does not mean high intelligence. Tell that to any fan of Beethoven or Yeats. I'm surprised that we are never told about the physical aspect of neuroplasticity. The neuron fires an electrical spark which, to insulate it from all the wrong receptors, is sent down the dendrite which is coated in fat, the myelin sheath. This is one reason why we need fat in our diets. The insulation gets worn a tiny bit by the spark and it is easier for the same path to be taken again, physically easier, than for a different path to be taken. We literally melt a little groove along the fatty brain. I believe this is why all religions require repetition, chanting, known responses, head bowing, gestures and physical movement like getting up and kneeling down, the more often repeated in company the better, in order to indoctrinate the growing brain and make paths well established by habit until only the creative, the strong-willed or those forced to can break out of the routine. The frequent suggestions for making yourself more creative, come down to thinking of a number of new ways to do something or combine words or ideas. The author however limits himself by proposing only one answer to three little puzzles; "III + III = III" make it correct with one match moved. He says to make both actions + whereas I say this does not complete anything and it should be make both actions =. A puzzle about treating a tumour "has only one resolution not everyone will see," but I immediately saw two other options such as swallowing a tube carrying a miniaturised tool. And he divides A,E and F from B,C,D on the basis that B,C,D are more rounded - while I saw that, I first saw that B has a midpoint cross bar the same as A,E,F. A portion I do agree with is studies of hyper-creative people, showing how they can be both introverted and extroverts at different times, modest but proud, strongly dedicated to the process of their creation and willing to make mistakes. And yes, the subconscious does answer a lot of our questions; the author does not go as far as suggesting we ask the subsconscious nicely to pull up the answer or show us in a dream, which I can do. Overall I am not impressed and my science based husband was even less impressed when I kept telling him of the errors in the text. But if you have not done any creativity boosting work it may be helpful. Notes on pages 239 - 245. I counted eleven names I could be sure were female. Me FASCINA todo lo relacionado con el cerebro y cómo éste funciona. Recuerdo que todos los temas que trata este libro cautivaron mucho mi atención un año atrás, así que definitivamente leeré más de este estilo y de este autor. Me dejó satisfecha y con ganas de aprender más; cualidad que encuentro de suma relevancia en un libro de este género. * Vale aclarar que el mismo va dirigido a lectores NO versados en el ámbito de las neurociencias. Es decir que para un ciudadano común y cor Interesantísimo! * Vale aclarar que el mismo va dirigido a lectores NO versados en el ámbito de las neurociencias. Es decir que para un ciudadano común y corriente -como yo- el libro resulta una lectura muy amena y didáctica. No soy gran amiga de los libros de autoayuda pero, como me ha tocado leer este por una cuestión de trabajo y he visto que está listado en goodreads, le pondré un comentario. Estanislao Bachrach, el autor, es un biólogo molecular argentino devenido en divulgador científico, cosa que - debo decir - hace bastante bien cuando conversa (es muy ameno dando conferencias). La tesis central de “ÁgilMente” es que la creatividad no es algo innato sino una capacidad que se adquiere con ejercicios y, cuando No soy gran amiga de los libros de autoayuda pero, como me ha tocado leer este por una cuestión de trabajo y he visto que está listado en goodreads, le pondré un comentario. Estanislao Bachrach, el autor, es un biólogo molecular argentino devenido en divulgador científico, cosa que - debo decir - hace bastante bien cuando conversa (es muy ameno dando conferencias). La tesis central de “ÁgilMente” es que la creatividad no es algo innato sino una capacidad que se adquiere con ejercicios y, cuando luego de estos trabajillos uno se convierte en un ser creativo, comienza a tener una vida más interesante. No voy a refutar esto. “ÁgilMente” empieza bastante bien y creo que la primera parte del libro, en la cual describe el funcionamiento del cerebro humano, es la más fuerte. Después, se va de mambo completamente y se nota a la legua que falta estructura. Una gran pena porque creo que Bachrach tiene mucho para decir y hay pocos libros en español sobre estos temas (hay por allí algunas similitudes con Edward de Bono, a quien el autor nombra). Personalmente, creo que el problema fundamental de “Agilmente” es la falta de lectorado. No solamente que se ve en la estructura tan floja sino que, además, tiene una redacción espantosa. Una cosa es ser ameno y coloquial y otra es mezclar en una misma frase verbos conjugados como se hace en castellano peninsular con verbos conjugados como en Argentina. Lo mismo con los pronombres. Queda horrible y, si bien alguien que vive cambiando países tiende a hablar así, es responsabilidad del editor que el libro sea publicado como Dios manda. Otra cosa que me molestó fue la falta de notas de pie de página porque me disgustan las citas al voleo (Fulano decía no sé qué… pero resulta que el autor no nos cuenta ni dónde lo dijo ni cuándo). La bibliografía es buena aunque un toquecín anticuada. No le recomiendo a nadie que se compre este libro pero si alguien lo descubre en la biblioteca de algún amigo o vecino puede darle tranquilamente una mirada. Pese a mi expectativas, el libro se acerca más a la autoayuda que a la divulgación científica. La parte divulgativa fue interesante y me sirve para complementar otros textos que he leído este año, pero la parte en que propone ejercicios para mejorar la creatividad simplemente la dejé pasar. Recomendable para lectores primerizos en temas de neurociencias. в России книга названа Гибкий ум. я честно не поняла почему автор все время говорит про креативность, а сама книги в приниципе про мозг. про мозг много информации и она просто изложена. если интересно разобраться в нейропластичности, амигдале и т.д. то вот оно все здесь и коротко. меня смутило несколько фактов. но может это трудности перевода. Really useful book for practicing your creativity. Lots of useful practices that also help you relax and think differently. Muy bueno!! !Muy interesante, te ayuda a darte cuenta de como funciona nuestra mente. Yo que no tengo mucha idea de biología por lo tanto me pareció bastante fácil de entender. Las explicaciones son bastante claras. Excelente libro, muy buenas técnicas que te ayudan realmente a conocer como es que funciona nuestra parte cerebral. Además te ayuda a desmitificar algunas cuestiones que creemos que son ciertas y también te ayuda a conocerte un poco más a vos mismo. Fácil de entender! H Muy bueno!! !Muy interesante, te ayuda a darte cuenta de como funciona nuestra mente. Yo que no tengo mucha idea de biología por lo tanto me pareció bastante fácil de entender. Las explicaciones son bastante claras. Creo que es un libro valioso, en especial para la gente de habla hispana, o latinoamericanos. Este libro recopila y recorre muchos puntos importantes a la hora de entender cómo pensamos y generamos ideas, explicándolos de una manera simple. Sospecho que la intención del autor es presentar los conceptos sin profundizar demasiado en ellos, aunque yendo a lo práctico para poder ejercitarlos y desarrollarlos. De hecho, lo más valioso que tiene este libro en mi opinión son las técnicas y ejercicios para Creo que es un libro valioso, en especial para la gente de habla hispana, o latinoamericanos. Un libro exquisito con muchos ejemplos y prácticas para desarrollar la creatividad a un muy buen nivel. Su forma de escribir es amigable y sencilla de entender en lo que a descripciones del cerebro compete. Una verdadera estafa. Pura sanata y calesita. aburridísimo. Es un libro pensado para un público de personas sumidas en la rutina y que no se hacen demasiadas preguntas. Yo, como persona que no escucha música en la vía pública porque prefiere caminar al son de sus cavilaciones, no encontré nada nuevo en este libro. ¿Juegos mentales de palabras? Ya lo hago. ¿Asociación libre de ideas aunque no tengan objetivo? Ya lo hago. ¿Anotar cualquier cosas que se me ocurra, cualquier idea, aunque no forma parte de nada? Ya lo hago. Si tenés un perfil más o menos así, n Es un libro pensado para un público de personas sumidas en la rutina y que no se hacen demasiadas preguntas. Si tenés un perfil más o menos así, no vas a sorprenderte demasiado. The best book I have read on Creativity till date. Unlike others, this book gives an insight into the mind-brain connection. Also some psychological lessons. Has interesting exercises and tricks to improve one's creative approach. Better than some vague 'invoke the goddess of creativity' kind of books in circulation. Highly recommended. 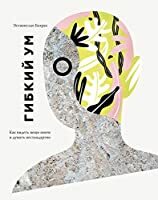 Отличная книга, чтобы понять, что такое наш мозг и как он работает. «Гибкий ум» — это некая энциклопедия по базовым знаниям о мозге. Подойдёт тем, кто первый раз задаётся этим вопросом. "(...) si bien el cerebro representa aproximadamente entre el 2 y el 5 por ciento del cuerpo, consume hasta el 20 o el 25 por ciento de la energía. Cuando el cerebro está trabajando a toda máquina usa más energía por unidad de tejido que un cuádriceps en pleno ejercicio." Un gran bel libro, scorrevole e pieno di informazioni e tecniche interessanti. I would love to say I read the reviews previously to reading this book but I did not. Please read them and don’t waste your time reading this book. Over simplistic and very few takeaways. Our mind is a vast endless universe and what we know about it is only the tip of the iceberg! Kinda waste of time. If you at least somewhat interested in the subject you probably already know everything this book can offer. A pitty. Es un poco difícil calificar este libro. En líneas generales, me pareció interesante. Me gustó como explica la forma en la que nuestro cerebro se fue desarrollando en el tiempo. También me gustó como están expuestas algunas teorías y estudios muy interesantes. En cuanto a los aspectos negativos, la primer mitad del libro me pareció bastante repetitiva. Tengo la sensación de haber leído la palabra "insights" muchísimas veces. Siento que últimamente existe mucha "presión" para ser creativo. Es "coo Es un poco difícil calificar este libro. En líneas generales, me pareció interesante. Me gustó como explica la forma en la que nuestro cerebro se fue desarrollando en el tiempo. También me gustó como están expuestas algunas teorías y estudios muy interesantes. Siento que últimamente existe mucha "presión" para ser creativo. Es "cool" ser creativo. Las empresas buscan gente creativa, sin tener en cuenta que, tal como dice el libro, deben brindar el espacio para que los empleados se relajen y puedan dar lo mejor de sí. Hoy en día, y más en Argentina, no queda otra que ser creativo para sobrevivir cada día. El "proyecto creativo" del cual el libro habla, no tiene por qué ser algo enfocado al Marketing, a lo empresarial, sino lo que a uno más le plazca. Es evidente que el autor sabe mucho de biología y conoce muy bien el funcionamiento del cerebro. Pero no es un libro de divulgación científica sino un libro de autoayuda sobre creatividad. El autor presenta como hechos sus reconstrucciones de cómo debe haber sido la vida cientos de miles años atrás. Sus ficcionamientos los asevera como hechos, del mismo modo que describe el funcionamiento del cerebro. Y allí confunde, lo mismo que cuando amparado en las neurociencias hace propaganda para la medit Es evidente que el autor sabe mucho de biología y conoce muy bien el funcionamiento del cerebro. Pero no es un libro de divulgación científica sino un libro de autoayuda sobre creatividad. El autor presenta como hechos sus reconstrucciones de cómo debe haber sido la vida cientos de miles años atrás. Sus ficcionamientos los asevera como hechos, del mismo modo que describe el funcionamiento del cerebro. Y allí confunde, lo mismo que cuando amparado en las neurociencias hace propaganda para la meditación trascendental y sobre el final, sobre otras creencias orientalistas. En siete capítulos muy bien estructurados, el autor logra combinar conceptos científicos (muy detallados) y bien elaborados, con ejercicios prácticos (muy sencillos) para invitar a las personas a lograr estimular su cerebro y así lograr nuevas conexiones neuronales que se traduzcan en mayor creatividad. Y este libro logra algo fundamental (que todos sabemos pero que necesitamos que nos recuerden cada cierto tiempo): La creatividad es mucho más esencial que la lógica tradicional. Es interesante lo que hace Bachrach, especialmente para la gente que no lee inglés. Estoy esperando que salga el próximo sobre el cambio, que ya lo tiene pero se va a demorar la aparición hasta después del mundial según dijo. Más importante el fútbol. Es un libro de divulgación interesante, para quien quiere conocer algo sobre la perspectiva de la psicología cognitiva de la creatividad, o para quien quiere introducirse en el estudio del tema o de esta perspectiva. Me llevó un tiempo terminarlo ya que me distraje con otras lecturas, pero es un libro de lenguaje accesible y de ágil seguimiento.